Our new “Places” endpoint takes millions of location data points (“places”) from across the UK and makes them searchable. You can query the endpoint to find one of these place types in particular (with the ‘type=’ parameter), or leave it to return a combination of place types. You can use it find a place somewhere in the UK e.g. 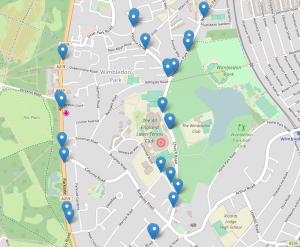 ‘Haywards Heath’, ‘Ridley Road’ or ‘TW13 5NT’ or you can limit the search within a particular area (a bounding box). The Places endpoint is designed to offer a flexible text-based search, which you might use to power a search box on a website or app. We use a smart PostgreSQL plugin which deals with typos people might make e.g .’Eston’ rather than ‘Euston’. What else can you use TransportAPI.com‘s Places endpoint for? Take the resulting coordinates, and an ‘accuracy’ value, and feed them into the journey planner endpoint. The full parameter and response structure is outlined in our RAML API reference documentation. The great news is you can access the Places endpoint for free (up to 1,000 hits/day on a “Start” plan) – all you need to do is register for an app id & key on developer.transportapi.com.